The Weser is the river that gave life to the city. Bremen became an important port and ship=building center and was a menber of the Hanseatic League in the Middle Ages. Now the shipyard is closed and Bremerhaven has the active port facilities. Here is information about some of the city districts of interest to visitors. Bremen-Mitte is the cenral city of modern high-risers, cafes and bars, but also the Altstadt (old city) of narrow alleys and historic landmarks. Mitte is, obviously, the favorate hangout for tourists. 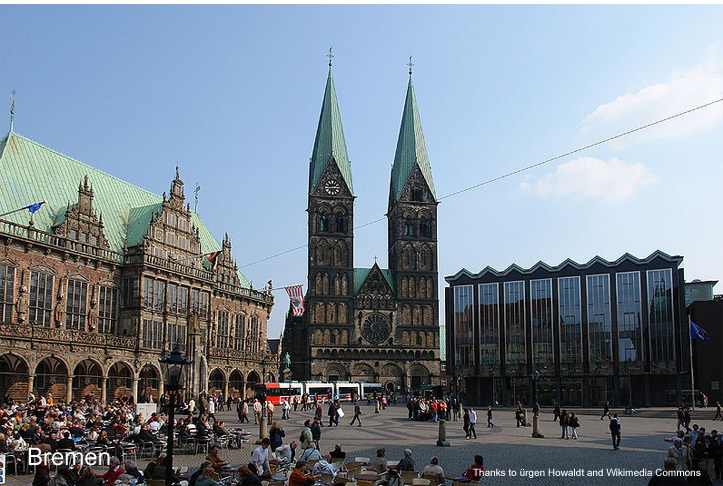 The Neustadt has charming residential areas, headquarters of large corporations and important cultural venues. Häfen is the port area. With piers and industrial activity confined to the left bank and the shipyards no longer in operation, the right bank has become a cultural and gentrified residential area. Horn-Lehe is home of a beautiful park of rhododendrons and azaleas, Bremen University, a technology park and Universum, a fascinating science museum. Bremen is divided into a number of Stadtteile (districts), as shown in the map below. In the "Hotels" section of this page, we have listed districts frequented by visitors. Hotel information is accessed by clicking on the district of interest.